Disney has updated their Parks Blog with another Star Tours - The Adventures Continue announcement. The new 3D attraction will make its Disneyland debut on June 3rd. This week at Toys R Us, you'll find a "2-for-$10.99" deal on all Hasbro action figures with a $7.99 regular price. This includes the Clone Wars and Saga Legends basic figure lines, but sadly it does not include the more expensive Vintage Collection basic figures. Scott has posted another new entry in JediDefender's Collect All 92! forum. Click on over to check out the comparison pics for another figure from Return of the Jedi - Ree-Yees. Wave 6 of Hasbro's Vintage Collection basic figures is now in-stock at Entertainment Earth! Stock is low, so act fast! The wave includes six new figures - VC44 Luke Skywalker (Dagobah Landing), VC45 Clone Trooper, VC46 AT-RT Driver, VC47 General Lando Calrissian, VC48 Weequay Skiff Master, and VC49 Fi-Ek Sirch. LucasArts has updated the Star Wars: The Old Republic developer blog with a post on Living the Life of a Live Producer. In the post, just like the title infers, Blaine Christine shares a behind-the-scenes look at the day-to-day activities of a SWTOR Live Producer. 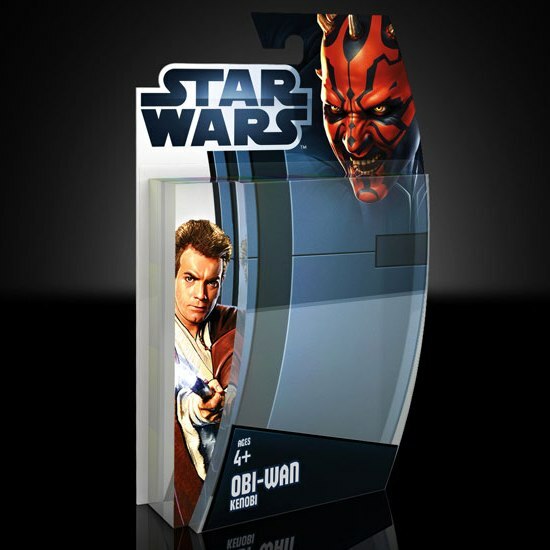 StarWars.com has officially revealed the 2012 Star Wars Packaging Design. Click on over to check out what Bill Concannon, principal at packaging design firm PILOT, and Stacy Cheregotis, director of global product development at Lucas Licensing, have to say about the new look! "A GALAXY FAR FAR AWAY IS GETTING A LOT CLOSER! 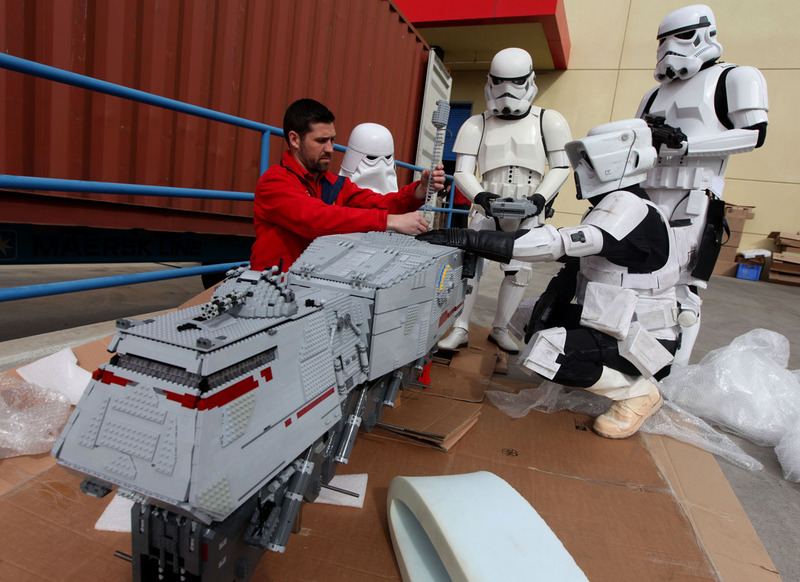 Stormtroopers, a snowtrooper and a biker scout were all on deck today at LEGOLAND California helping unload more than one thousand LEGO models for the new STAR WARS Miniland opening March 31 at the family theme park in Carlsbad. Master Model Builders unloaded crates containing several models including the Crystal Building, Clone Turbo Tank, and the Naboo Hangar where the duel between Obi-Wan Kenobi, Qui-Gon Jinn and Sith apprentice Darth Maul will be seen. The models are part of 2,000 that are arriving to be installed in STAR WARS Miniland. LEGOLAND California will be the first of three LEGOLAND Parks to launch a new STAR WARS Miniland area. The area includes seven scenes – six of the most famous scenes from the six live-action STAR WARS movies, as well as one from the animated series STAR WARS: THE CLONE WARS  all made out of 1.5 million LEGO bricks and built in 1:20 scale." The Official Star Wars Website has posted a new behind the scenes video to give fans another peek at Chewbacca's upcoming appearance in The Clone Wars. Click on over to check out how Peter Mayhew, Dave Filoni, and the rest of the Clone Wars team went about recreating Chewbacca for the animated series. StarWars.com has updated with a look at the cover art for Shadow Games, a new Star Wars paperback novel written by Michael Reaves and Maya Kaathryn Bohnhoff. Shadow Games, which features cover art by Scott Biel, is scheduled for release this October from Del Rey Books. Sentinel, the sixth installment of The Lost Tribe of the Sith, is now available for download. The series, which was designed to complement the Fate of the Jedi series from Del Rey books, is written by John Jackson Miller and focuses on, well, a lost tribe of Sith descendents. Dark Horse Comics recently announced that there will be a new Star Wars: The Clone Wars story featuring Season Three villain Savage Opress available on May 7th, Free Comic Book Day! The story will be bundled in a "flip cover" comic, with the The Clone Wars story on one side and an Avatar: The Last Airbender story on the other. Arriving at your local comic book shop this week are two new comics from Dark Horse - Star Wars Legacy: War #3 and Star Wars: Darth Vader and the Lost Command #2. Can't wait to read them? Then follow the links for previews to tide you over! It took a little while, but the 2011 Hasbro price hikes have hit Walmart. The Vintage Collection basic figures are now $8.96 each and the Clone Wars basic figures are around $7.96 each. Saga Legends pricing varies - some stores have hiked the price ($7.96 each), while others are dropping the price to reduce inventory (as low as $4.88 each in some areas). This week at Toys R Us, you'll find the Clone Wars Deluxe Vehicle Assortment on sale for 50% off the regular price. Yep, what was once an over-priced $70 ship can be yours for just $34.99 each. At most Toys R Us stores, other selected Hasbro Star Wars toys are also on sale for 5%-10% off the regular price. LucasArts has updated the Star Wars: The Old Republic website with a new Studio Insider post. In this entry, Concept Artist Diego Almazan explains how he created the concept for the imposing Sith burial ground, while Executive Producer Rich Vogel answers some questions from the SWTOR Community Q&A section. We've received a few reports that the latest wave of Target's exclusive Clone Wars 2-Packs (DPCI# 087-06-0044) are now popping up at retail. The wave includes two new sets based on the Season Two Geonosis arc - Special Ops Clone Trooper & Geonosian Drone and ARF Trooper Waxer & Geonosian Battle Droid. Sideshow Collectibles has announced the final edition size for their new 12" Gamorrean Guard figure. This little piggy will be limited to 3500 pieces worldwide. He's still in-stock now, so grab one before they're gone! Yep, another Original Trilogy character is being jammed into The Clone Wars animated series on Cartoon Network. Who? Well, if the thumbnail over there didn't already give it away, it's the mighty Wookiee himself, Chewbacca! Check out the New York Times' Arts Beat blog for all the details and a sneak preview clip of animated Chewie. The Clone Wars online comic continues through Season Three of the animated series. Click on over to check out what Obi-Wan and Anakin are up to in Part 12 of The Clone Wars: The Valsedian Operation. The Official Star Wars Website has added twenty Ahsoka Tano quotes to the Star Wars Soundboards. Follow the link and have some fun mixing and mashing the sounds of Anakin's eager Padawan. - VC44 Luke Skywalker (Dagobah Landing), VC45 Ep2 Clone Trooper, VC46 AT-RT Driver, VC47 General Lando Calrissian, VC48 Weequay Skiff Master, and VC49 Fi-Ek Sirch. Entertainment Earth is also now taking pre-orders for Wave 7 of Hasbro's Vintage Collection basic figures. The wave includes six new figures - VC50 Bespin Han Solo, VC51 Barriss Offee, VC52 Rebel Fleet Trooper, VC53 Bom Vimdin, VC54 ARC Trooper Commander (aka Captain Fordo), and VC55 Logray. StarWars.com has updated with a first look at the cover art for Ascension, the eighth book in the Fate of the Jedi series from Del Rey. Ascension, which features cover art by Ian Keltie, was written by Christie Golden and is due out in August 2011.
eFX Collectibles is now taking pre-orders for the Luke Skywalker "Reveal" Lightsaber replica. 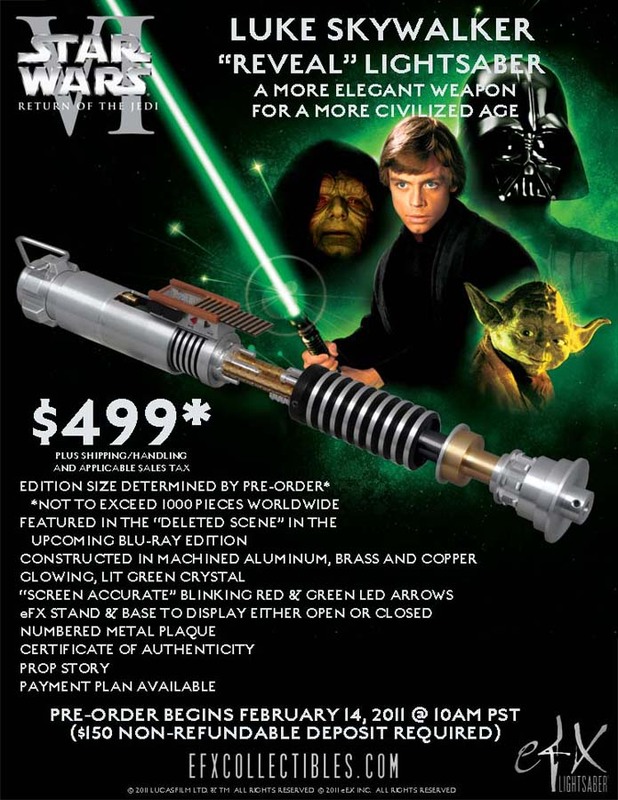 The replica is based on a version of Luke's saber featured in a deleted scene from Return of the Jedi that will be added to the upcoming Blu-ray release. The saber costs $499 plus shipping/handling with a $150 non-refundable deposit required. Just a reminder that our pals over at JediDefender are running their annual Hasbro action figure Wishlist poll, starting with The Phantom Menace. Click on over to the JediDefender Forums and cast your vote today! Anakin and Obi-Wan lead a rescue mission in The Citadel, the start of a new, three-part storyline in Star Wars: The Clone Wars on Cartoon Network this Friday. Tune in to see if the elite Jedi rescue team can free Jedi Master Piell from the Citadel, an impenetrable Separatist prison! 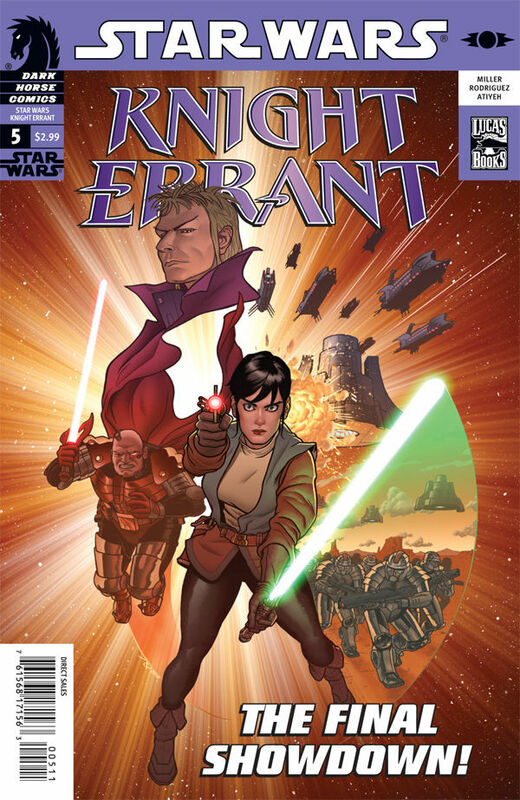 Arriving at your local comic book shop this week is Star Wars: Knight Errant #5 from Dark Horse Comics. Can't wait to read it? Well then check out Dark Horse's website for a preview to tide you over! Another crazy weekend at Toy Fair! I hope you've all been following along with both the Toy Fair 2011 coverage here and the stuff that I've been helping to post over at JediDefender. Now that things have settled down, I've had a chance to fill out my Toy Fair 2011 coverage here at HH. Feel free to check out our Toy Fair 2011 page for another look at the toys! Our Toy Fair 2011 coverage in New York ends with a final look at some of the miscellaneous vendors attending Toy Fair 2011. Click on the Flickr block below to check out our pics from various displays and booths around the Javits Convention Center, including Star Wars products from Underground Toys, Kotobukiya, and more! Our Toy Fair 2011 coverage continues with pictures from the Playmobil Showroom. Click on the Flickr block below to check out our pics of the latest Playmobil products, including the new blind-packaged figures and Top Agents line! Our Toy Fair 2011 coverage continues with pictures from the Mattel Showroom. Click on the Flickr block below to check out our pics from Mattel's DC Comics lines, including the new Green Lantern movie toys! Our Toy Fair 2011 coverage continues with pictures from the DC Direct Showroom. Click on the Flickr block below to check out our pics from the DC Comics display area, including brand new Green Lantern movie and comic products! Our Toy Fair 2011 coverage continues with pictures from the Uncle Milton Showroom. Click on the Flickr block below to check out our pics from Uncle Milton's Star Wars Science toy line! Our Toy Fair 2011 coverage continues with pictures from the Funko Showroom. Click on the Flickr block below to check out our pics from Funko's Star Wars and DC Comics product lines! Our Toy Fair 2011 coverage continues with our final look at the LEGO Showroom. Click on the Flickr block below to check out the rest of LEGO's various sub-lines - City, Atlantis, Ninjago, Pharaoh's Quest, Alien Conquest, and more! Our Toy Fair 2011 coverage continues with more pictures from the LEGO Showroom. Click on the Flickr block below to check out our pics from the LEGO Duplo display area! Our Toy Fair 2011 coverage continues with more pictures from the LEGO Showroom. Click on the Flickr block below to check out our pics from LEGO's various summer movie-themed lines - Harry Potter, Pirates of the Caribbean, and more! Our Toy Fair 2011 coverage continues with pictures from the LEGO Showroom. Click on the Flickr block below to check out our pics from the LEGO Star Wars display area! Our Toy Fair 2011 coverage continues with our last batch of photos from Hasbro's Showroom. Click on the Flickr block below to check out some final pics from miscellaneous display areas! Our Toy Fair 2011 coverage continues with more pictures from the Hasbro Showroom. Click on the flickr block below to check out our pics from the Hasbro Transformers display area! Our Toy Fair 2011 coverage continues with more pictures from the Hasbro Showroom. Click on the Flickr block below to check out our pics from the various Hasbro Marvel Comics display areas - Captain America, Thor, Iron Man, and more! Our Toy Fair 2011 coverage continues with more pictures from the Hasbro Showroom. Click on the Flickr block below to check out our pics from the G.I. Joe display area! Our Toy Fair 2011 coverage continues with more pictures from the Hasbro Showroom. Click on the Flickr block below to check out our pics from the new Playskool Heroes display area! Playskool Heroes, Hasbro's new line of figures for preschoolers, contains a Star Wars segment (Jedi Force), a Marvel Comics segment (Super Hero Adventures), and a Transformers segment (Rescue Bots). R.I.P. Galactic Heroes and Robot Heroes. Our Toy Fair 2011 coverage continues with pictures from the Hasbro Showroom. Click on the Flickr block below to check out our pics from the Hasbro Star Wars display area! Our Toy Fair 2011 coverage continues with more official Hasbro press images. Click on the Flickr block below to check out the slides from the Toy Fair 2011 GI Joe Presentation! Our Toy Fair 2011 coverage continues with more official Hasbro press images. 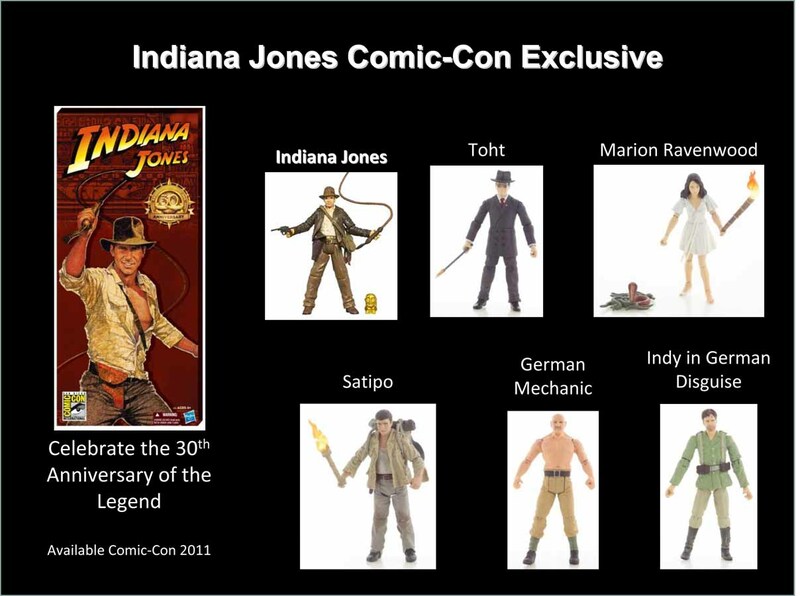 Click on the thumbnail below to check out the slide from the Toy Fair 2011 Indiana Jones Presentation! No, you didn't read that wrong - Indy's making a comeback. 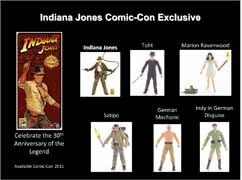 The "lost" Raiders of the Lost Ark wave is finally being released as a San Diego Comic Con exclusive in 2011! Our Toy Fair 2011 coverage continues with more of the Hasbro Star Wars press images. Click on the Flickr block below to check out the official Star Wars product photos from Hasbro! Our Toy Fair 2011 coverage kicks off with official Hasbro press images. Click on the Flickr block below to check out the slides from the Toy Fair 2011 Collector Event Presentation! Toy Fair 2011 Report - Hasbro! Well, we're back from the Hasbro show - a pile of goodies were unveiled and we'll start uploading pics soon. Until the pics get processed, here are some Clone Wars and Vintage Collection basic figure highlights for you to discuss! - Clone Wars Wave 21 (Spring 2011 Wave 2) will be made up of five new figures - Season Three Ahsoka Tano, Season Three Anakin, El-Les, Clone Commander Wolffe, and Aqua Battle Droid. - Clone Wars Wave 22 (Spring 2011 Wave 3) will be made up of four new figures - Eeth Koth, Bariss Offee, Clone Commander Colt, and Riot Gear Clone Trooper. - There will be a pile of new Deluxe Vehicle with Figure sets this Spring. Look for a Boba Fett Set, a Castas set, and more! - Vintage Wave 6 will be made up of six new figures - Dagobah Pilot Luke Skywalker, General Lando Calrissian, Weequay Skiff Master, Fi-Ek Sirch, AotC Clone Trooper, and AT-RT Driver. - Vintage Wave 7 will be made up of six new figures - Bespin Han Solo, Bariss Offee, Rebel Fleet Trooper, Bom Vimdin, Logray, and Clone Trooper Commander. Which Commander you ask? Well it's the trooper previously known as Captain Fordo. Apparently they can't call him Fordo for some reason, so he gets a generic name. The good news on Fordo is that he comes with two helmets and two sets of pauldrons so you can set him up to be Phase I or Phase II. - Vintage Wave 8 will be made up of five new figures - 501st Clone Trooper, Aayla Secura, Kithaba, Nom Anor, and Dr. Evazan. Nom Anor will come with removable spikes and armor, allowing you to pose him however you'd like your Vong to look. - Vintage Wave 9 was sneak previewed, with three new figures being shown - Bastilla Shan, Echo Base Trooper, and Ponda Baba. Look for the rest of the wave to be shown later. Of note - Ponda Baba will come with two sets of hands - regular and flippers! - This year's chase figures will be based on the "Revenge of the Jedi" logo. Look for 12 carded figures with the "Revenge" logo as chases to be packed into the assortments this Fall. Also, there will be a mega-boxed set of all 12 chase figures at SDCC'11. The SDCC set is packaged in a fancy Death Star II box and includes bonus Salacious Crumb and Mouse Droid mini-carded figures. - This year's mail-away will be the 1978 Prototype Armor Boba Fett. Imagine the classic Fett armor in black and white and you're on the right track. - Galactic Heroes are done. The line is ending with the current wave. There will be a new line of preschooler themed Star Wars toys (Jedi Force) that will be replacing the GH toys. No word on the fate of the lost AT-ST Cinema Scene. American International Toy Fair 2011 is here and we'll be hitting the Jacob K. Javits Convention Center and the Toy District of New York City this weekend to cover the show. Be sure to keep an eye out for our take on all the latest and greatest from Hasbro, LEGO, and Mattel! - The Final Gallery - pics from around the Javits Center! ** Our coverage of Toy Fair 2011 is sponsored by the fine folks at JediDefender.com - I'm pulling double duty posting at both sites once again this year, so be sure to check out the coverage over there too! LucasArts has updated the Star Wars: The Old Republic website with a new holorecord on The Great Hyperspace War. In the video, Master Gnost-Dural identifies the controversial decision that drove the Sith into exile and set up the Empire’s campaign of vengeance against the Republic. Who Will Be the Stars of the New Star Tours? Disney has updated their Parks Blog with another update on the Star Tours 3.5 ride. It looks like a few more classic trilogy characters will be joining the ride's cast - Darth Vader, Boba Fett, Admiral Ackbar and more! Scott has posted another new entry in JediDefender's Collect All 92! forum. Click on over to check out the comparison pics for the first figure from Return of the Jedi, Jabba's Majordomo Bib Fortuna! American International Toy Fair 2011 hits the Jacob K. Javits Convention Center and the Toy District of New York City this weekend and Han's Hideout will be there to cover the show. Be sure to stop by the site throughout the weekend to check out our take on all the latest and greatest toys from Hasbro, LEGO, Mattel and more! ** Our coverage of Toy Fair 2011 is sponsored by the fine folks at JediDefender.com - I'll be pulling double duty posting at both sites again this year, so be sure to keep an eye on JD too! Anakin Skywalker faces visions of his own future in Ghosts of Mortis, this week's new episode of Star Wars: The Clone Wars on Cartoon Network. Tune in for the final chapter in the Mortis trilogy to learn Anakin's fate! The Official Star Wars Website has added twelve Ziro the Hutt quotes to the Star Wars Soundboards. Follow the link and have some fun mixing and mashing the sounds of Jabba's sneaky uncle. Entertainment Weekly has posted an exclusive new LEGO Star Wars III trailer! The video offers up a new sneak peeks at the third version of the popular LEGO Star Wars game, which focuses on The Clone Wars and is due in March 22 for the Xbox 360, Sony PS3, Nintendo Wii, Nintendo DS, Nintendo 3DS, Sony PSP, and Windows PC. Star Wars Action News has posted their latest podcast episode entitled How Do You Talk About A Lollipop Without Sounding Dirty? In this episode, the SWAN team talks Valentine's Day candy, magnets, pencils, and more. There's also a review of the recent EE Comic packs. 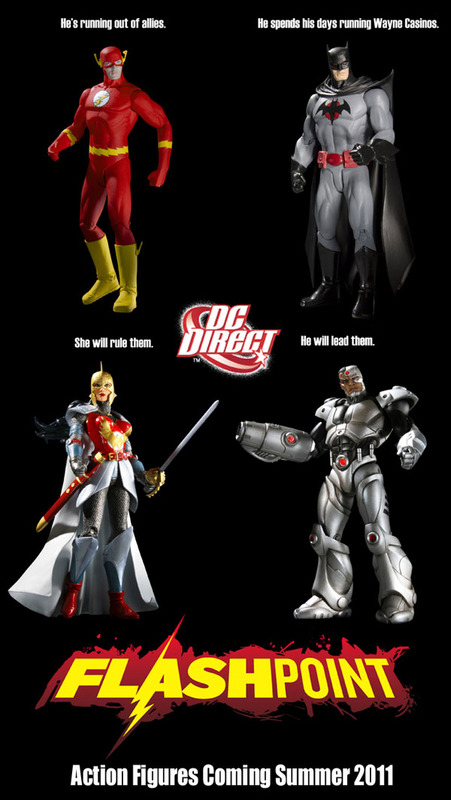 DC Direct has announced plans for action figures from the event of the summer - the highly anticipated "Flashpoint"! Included in Series 1 are the Flash, Batman, Cyborg, and Wonder Woman. Click on the thumbnail to check out the figures, but beware the image could be a potential SPOILER for the mini-series. Look for them this summer! The Hollywood Reporter has an interesting article on the evergreen nature of Star Wars toys. It seems that 2010 generated over $510 million in sales. No word on how those sales translate to profits for Lucasfilm, Hasbro, and the retailers, but it's safe to assume with those kind of sales Star Wars toys will be around for a while longer. The Disney Parks Blog has officially announced the dates for Star Wars Weekends 2011! The popular Star Wars event will take place at Disney's Hollywood Studios theme park on May 20-22, May 27-29, June 3-5, and June 10-12 of this year. LucasArts has updated the Star Wars: The Old Republic developer blog with a post on Building Flashpoints. World Designer Jesse Sky offers a bit of a behind-the-scenes look at the creation and purpose of Flashpoints, the game's multi-player adventures. StarWars.com has posted a nifty look at The Star Wars Craft Book from Random House. Written by Bonnie Burton, the book is packed with projects suitable for both crafting Padawans and Jedi Masters alike. The Official Star Wars Website has posted a sneak preview at Hasbro's new line of Ultimate FX Lightsabers. If you've ever wanted to wield a Force FX lightsaber at an affordable price, this one's for you! Expected to cost around $35 each, the Anakin Skywalker and Darth Vader sabers will hit stores in August. Sideshow Collectibles is now taking pre-orders for the Premium Format Emperor Palpatine and Imperial Throne Set! Click here to pre-order the Sideshow Exclusive version or click here to take advantage of the FLEXpay option. The exclusive edition includes a switch-out portrait for alternate display and is limited to 500 pieces. Entertainment Earth is now taking pre-orders for a new revision case of Vintage Collection Wave 3. Why should you care? Because this revision case apparently has the delayed VC28 Wedge Antilles figure in it! No word from Hasbro yet on whether or not Wedge will be appearing in any other case assortments. Stay tuned! Entertainment Earth is also taking pre-orders for Saga Legends Wave 3, which I guess is the first new Saga Legends assortment for 2011. The assortment introduces a few new figures into the Legends mix, namely the Death Star Trooper, EU Spacetrooper, and Stormtrooper. Volkswagon has posted their Star Wars themed Superbowl Ad on-line. In the spot, a pint-sized Vader encounters the new 2012 Passat. Check it out below! Disney has updated their Parks Blog with an update on the Star Tours 3.5 ride. George Lucas paid a visit to Disneyland to take a few test rides and even took a moment to pose with the Audio-Animatronics C-3PO in the Starspeeder cockpit! StarWars.com has posted a feature on the 2011 Star Wars Valentines from Paper Magic Group. Kids (and adults too) can choose from a variety of Clone Wars valentine products, which are on sale at a store near you. Ahsoka Tano is taken captive by the Son in an attempt to entice Anakin Skywalker to join the dark side in Altar of Mortis, this week's new episode of Star Wars: The Clone Wars on Cartoon Network. Will our Jedi hero trio escape Mortis this week? Tune in and find out!